Clay Jenkins returns home from school to find a mysterious box with his name on it lying on his porch. Inside he discovers several cassette tapes recorded by Hannah Bakera–his classmate and crush who committed suicide two weeks earlier. 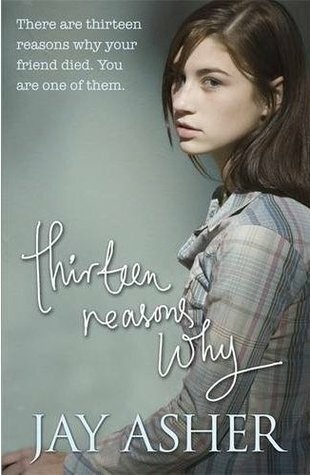 On tape, Hannah explains that there are thirteen reasons why she decided to end her life. Clay is one of them. If he listens, he’ll find out how he made the list. This is a desperate, heartbreaking, yet ultimately hopeful novel. I went into this book expecting to either love it or hate it. I had noticed that most reviews were either 5 stars or 1-2 stars, so I thought it was this kind of love-hate book. But it turns out I really really liked it, but I can’t say I loved it. This is the story of Hanna’s suicide. Before killing herself she recorded thirteen tapes containing the reasons she killed herself and mailed them to all the people that were involved. We follow Clay, one of the people that received a set of tapes as he is listening to them and unraveling the mystery of Hanna’s death. “I felt really bad after coming out of that room. I know Hanna, I saw your face right after that. Other people are walking into the cafeteria, none of them knowing what I’m going through. The letters in italics are always Hanna’s words, so you can differentiate. But Clay is speaking both about his feelings to the story and about things that are happening while he’s listening to the tapes. So it takes some time to get used to. It’s no problem after a while, though. As for the story, I really liked it. I knew from the moment I first read the synopsis that it would be really interesting. It’s like nothing I’ve ever read before and it was very intriguing. I really wanted to learn about all the people involved in Hanna’s death and see to what conclusions all those cassette tapes would lead to. I don’t have that much to say about the characters. I liked how much Clay sympathized with Hanna, but that’s the only thing I can say about him. I don’t feel like I really got to know any characters very well and I didn’t feel very emotionally connected to any. As for Hanna, I wanted to like her from the beginning. I wanted to find out what had gone wrong in her life and how hard everything must have been for her, so much so that she ended up killing herself. But I can’t say I really liked her. I felt like she was overreacting quite a bit and I can’t really say I completely understand the reasons behind her suicide. This is also the reason why I decided to give this book 4 stars instead of five. I feel like the main goal of the book was for us to understand why Hanna committed suicide. And I can’t say I do. I can partly understand it, but I cannot grasp it completely. I mean different events affect people differently and maybe because everything that happened to her is not something that would bother me to such a degree as to kill myself. Maybe that’s why I feel like I don’t understand her completely. All in all I really enjoyed this book. I expected it to be a lot heavier, but it’s a relatively easy read. Maybe the fact that it’s quite short also plays a role here. But I would certainly recommend it and I really want to read some more books that contain “psychological” issues (suicide, abuse etc). Can’t say I’ve read a lot of those and it’s a genre I would be very interested in. I really liked the story! I felt similarly about Hanna. I understood her reasoning at times, but other times she seemed melodramatic. I liked that Asher kept it short and simple enough that younger readers would pick it up. I hope this book has changed some people’s opinions on bullying, it has a really good message. yes, I also thought she was a bit too much at times, but I still enjoyed the book overall! Maybe the fact that it’s quite short also plays a role. I’m looking forward to reading this book. Great review! 🙂 It’s made me want to read it sooner! I also had a couple of issues with it, but they were really minor. I also liked the bullying message a lot, so I guess that’s definitely a plus! I would like to get more into the story on one hand, but I also liked that it wasn’t a very long book and was easy to read!